How Does Bioidentical Progesterone Help? Bioidentical hormone replacement therapy is not a one-size-fits-all. Every woman has her own health goals, personal and family history when it comes to prescribing hormone replacement. And there are many questions pertaining to, ‘how to take, when to take, how much to take.’ Below I wanted to answer some reader questions. These questions are really common, and they revolve around progesterone. But you will see that BHRT can be a bit complicated as each dose should be tailored for the individual. Before reading, I have to tell you that this is not medical advice and purely educational (or my attorney will be really mad at me). But it is fair to say, if you are reading this, then you have hormonal concerns of your own. Thank you for reading and please feel free to reach out to us. I have been on Biest 80/20 1mg with 50mg progesterone per pump since I started menopause symptoms about 1.5 years ago. I started with one pump at night vaginally, and I had results within days. As time went on, I started to get hot flashes and so per my Dr.’s recommendation started 2x a time. Morning transdermally and evening vaginally. There are times I would feel estrogen overload so I would back off to 1 day. But for the most part 2 a day and it has worked great for me. However, for the last month I have been having hot flashes mostly at night, night sweats and slight insomnia (not as bad as pre biest). I am working with my Dr. on dosage change and know she definitely prefers lower dosages, but we may increase the dose to 1.25. I am just wondering if it is the progesterone may need to be higher or possibly separately? And keep biest as is? In all other regards, I feel great. Dr. Davidson’s Response: Dear CeeCee, this is a great question. There are a few aspects that I think need to be considered. First, do you have a uterus? If so, you need more progesterone. Estrogen will thicken the lining of the uterus making you prone to spotting and increase the risk for uterine cancer. Bioidentical hormones are amazing, but they do not have a long lifespan. CeeCee, if you are applying your hormone cream in the morning, by the evening, the hormones have pretty much worn off. This might contribute to trouble sleeping, night sweats and night hot flashes. Splitting up the biest hormone cream into twice a day can help with the nighttime hot flashes and sleep. Progesterone is very relaxing, so taking it in the morning can make you tired. Which is why in most cases, I usually reserve progesterone for the evening. Unless there is a lot of anxiety going on. As progesterone is very relaxing. Or I am trying to get an already thickened uterine lining to reduce. As I mentioned before, this is not medical advice but… I would suggest CeeCee have a separate progesterone to take at night and convert it into a capsule. If CeeCee has trouble staying asleep through the night, then a sustained release progesterone capsule can be really helpful. Also, I would have CeeCee continue taking the Biest as a cream. But have her take the cream morning and evening. I do like like lower doses of estrogen. Less is truly best. But I would raise CeeCee’s biest dose as it may be too low or at least split it up to twice a day to help with sleep and nighttime hot flashes. I recently went in to get my annual checkup with my ObGyn, and they recommended progesterone cream – instead of pills being currently prescribed to me. I wanted your feedback, thanks. Specifically, the estrogen will grow the uterine lining and cause spotting or a period. The excess growth of the uterine lining is a risk for uterine cancer. By taking the progesterone orally at an appropriate dose will keep the lining of the uterus thin. This will reduce the risk for uterine cancer and spotting or bleeding. When I say “appropriate dose” of progesterone orally, I mean that too low of a dosage can still promote uterine thickening. So in answer to Marie’s question, yes, the progesterone capsule is very important for you to take. As the cream will not give you enough protection for the uterus and may promote spotting or bleeding. I have trouble staying asleep for more than 3 hours at night. What is the name of this sustained release progesterone capsule? Where can I get it? Is MD able to prescribe it? Dear Linda, the name is a Sustained Release Compounded Progesterone Capsule. I am not sure about other countries, but in the United States, this is a prescription medication that is made at a compounding pharmacy. While it is prescribed by your physician, many docs are not familiar with it. Talk to your doctor about the sustained release progesterone capsule. Although, there may be other reasons that you cannot sleep more than 3 hours. It could be your cortisol is elevated in the middle of the night. For more information, be sure to check out our other blogs about sleep and staying asleep. I am only taking 25 mg of Progesterone pill form at night, and I still feel sluggish and sleepy all the next day. It is bioidentical but not sure if it’s immediate or sustained release. Which one would tend to make you less sleepy the next day? Dr. Davidson’s Reponse: Dear Marybeth, a progesterone 25mg capsule is a pretty low dose. You would not want to go any lower than 25mg to be effective. But if you are feeling sluggish and tired the next day, you might want to consider an instant release. Although progesterone can make you relaxed and tired shortly after you take it, you might want to take it earlier in the evening. Some people that are sensitive to progesterone take it as early as 6-7pm. But to answer your question, an instant release would make you less sleepy the next day opposed to sustained release. To further elaborate on Marybeth’s question, there may be other issues concerning her daytime drowsiness. Possibly, looking into blood sugar/glucose, insulin levels. Cortisol is secreted from the adrenal glands and is highest in the morning and will stay up moderately in the day and drop at night. In some people, their cortisol levels are low in the morning and/or afternoon. Causing morning and/or daytime sleepiness. Higher levels of insulin can also drop blood sugar causing fatigue after eating and daytime drowsiness. I’m 62 long postmenopausal. Can’t get my Progesterone levels above 1 ng/ml with any oral formulation anymore. I still have a uterus. I did try 200mg promethium. Horrible side effects. So you are saying if I have a uterus I must take an oral formulation? So what do I do? My uterus is ablated. Not sure if that makes a difference. Dr. Davidson’s Response: Dear Cheri, I understand your concern and get this question often. Progesterone orally is usually taken at night. Progesterone capsules can make you tired, which is great for sleep. You do not necessarily want a lot of progesterone in your bloodstream during the day because it is so relaxing. Which is why you would not want to take progesterone orally in the morning. Because you take your progesterone at night, when you get your blood work done in the morning the progesterone levels look low. That is actually normal, as you do not want high levels of progesterone in your bloodstream during the day. So to answer Cheri’s question, if you are taking an oral form of progesterone, your blood levels would be low the next day when you take your blood work. That doesn’t mean your progesterone is not working. That is why when we have patients do blood work for hormones and thyroid, we have them have the blood drawn 3-5 hours after taking their hormones. Now you cannot go and get your blood drawn in the middle of the night for progesterone. So we usually deal with progesterone based on a person’s symptoms. Are they sleeping well? Uterus? Any periods or spotting? Irritability or mood issues? Waking up in the middle of the night? These are a few questions that can help determine what dosage is needed for progesterone. It is important to take progesterone orally if you are taking estrogen and you have a uterus. Now to further answer Cheri’s question. She has had a uterine ablation, so the likelihood of her lining thickening for risk of uterine cancer is low. But her lining regardless of ablation will thicken a bit if she takes only estrogen and no progesterone. So Cheri should take an oral form of progesterone. Because the 200 mg Prometrium had side effects, she might want to consider 100mg. Or she might want a compounded form, as Prometrium is made from peanuts and she might have a peanut allergy. And the fillers in the Prometrium might be affecting her. Or even consider sustained release progesterone compounded if she is having trouble staying asleep through the night. Hello, I loved your article on Progesterone cream vs. the pills. I am seeing a BHRT doctor here in Michigan. They said my progesterone is low, so they upped my dose to 200mg from 100mg per day. I took two pills, and my legs were crazy at night. It made me sleepy, but also made me antsy. Dr. Davidson’s Response. Dear Carrie, thank you for your question. I think others can relate to Carrie’s concerns. As it can be common to be sensitive to progesterone. It might not be the actual dose that is bothering your legs. It could be the fillers that are in the progesterone itself. Common conventional progesterone is Prometrium. Prometrium has peanut oil in it. If you are sensitive to peanuts, that could be the culprit. Possibly it could be other fillers and binders in the Prometrium/progesterone regardless of the peanut oil. Some pharmacies put lactose in their progesterone capsules. If Carrie has a lactose or milk sensitivity, that would be our culprit. It would be a good idea for Carrie to call her pharmacist and find out what fillers are in her progesterone capsule. It could also be instant-release versus sustained-release that could be causing Carrie’s reaction. The instant-release progesterone capsules can cause the progesterone to rise quickly in the bloodstream. This sharp rise may be causing Carrie’s issues at night. If Carrie is on an instant-release progesterone, it might be a good idea to switch the sustained-release. The slower rise and longer sustainability of the progesterone through the night may reduce her leg symptoms. Not to confuse things here, I just want to be as thorough as possible. But it definitely seems it is the oral form of progesterone causing Carrie’s leg symptoms. 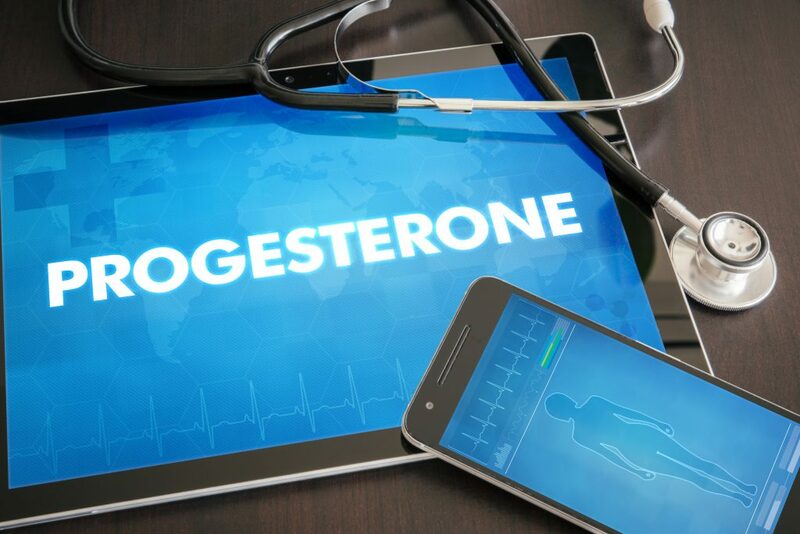 Progesterone itself raises GABA and dopamine. Which sometimes can help or make restless legs worse. But because the cream doesn’t seem to contribute to Carrie’s symptoms, I really do not think it is the rise in these neurohormones. Otherwise, the cream would have reduced her symptoms. Hi. Thank you for this helpful article. I started 100 mg bioidentical progesterone for a month for sleep (fall asleep fine but wake up in the early morning hours and have difficulty falling back to sleep). I am 50 y/o. I increased it to 200 mg a few days ago and doing much better. My question: How long should one be on bioidentical progesterone and how safe is it? Sorry, my previous question was unclear. I didn’t find 100 mg worked that well which is why I increased to 200 mg.
Dr. Davidson’s Response: Progesterone is great for helping a woman stay asleep through the night. Oral forms seem to help better than the creams for sleep. If you are on a progesterone cream at night and notice that you are still having trouble staying asleep through the night, it could be helpful to switch to an oral form. Women with low progesterone often state that they have no trouble falling asleep. As soon as their head hits the pillow, they are out. With low progesterone, women will often wake up 3 hours later and cannot go back to sleep for at least an hour. Or they end up waking up multiple times through the night. Needless to say, in both cases, these women are very tired the next day. In Sandra’s case, the 100mg progesterone was not enough for her sleep, and the 200mg worked much better. This is common, anywhere between 100-200mg of progesterone helps you stay asleep through the night. The great thing about compounding pharmacies is you can have any dose made for a patient. I have some women on 125mg progesterone or 150mg if the 200mg is too high for them. Other options to help a woman stay asleep through the night is to use a sustained-release form. Sometime the instant release will leave the body too quickly and then a woman will find herself waking up too early in the morning. But then again, in some cases the sustained-release might linger too long, making it hard to wake up the next day. As you can see it really depends on the individual and her personal history and health goals in determining the correct dosage. To answer Sandra’s question, bioidentical progesterone is safe to take for an extended amount of time. As oppose to progestins or non-bioidentical progesterone, is not safe to take at all. As long as Sandra is being monitored by her doctor and doing well on the 200mg progesterone, she can take long term. Everyone is an individual when it comes to dosing and taking BHRT. And once a dose is established, it may need to periodically adjust due to age, time, stress, goals or side effects. That is why it is important to have regular lab work and follow-ups with your BHRT doctor. These readers were already taking some form of BHRT but were having either side effects, concerned about risk, or was not efficient to meet their goals. This is really common to have to change doses or change the administration of the medication. Thank you to our readers that took the time to explain their situation and ask questions. I hope this helps everyone reading. If you have any questions of your own, leave a comment below or send an email to help@progressyourhealth.com.